Throughout the history of humankind, art and nature have gone hand-in-hand. At two nature parks in Hendricks County, the opportunities to blend artistic talent with Mother Nature continue to thrive. I am the Assistant Superintendent with Hendricks County Parks & Recreation, and we operate McCloud Nature Park just outside of North Salem, Sodalis Nature Park in Plainfield, and a 4.5-mile stretch of the Vandalia Trail that runs from Amo through Coatesville to the Hendricks-Putnam County line, where it connects with People Pathways all the way to Greencastle. We think nature is beautiful, and we love to see it immortalized in art. Paintings, photography, sculpture, drawings, quilting, crochet, jewelry... We don&apos;t care what medium. We just love to see nature and art come together. To that end, our park naturalists display local artwork at the Nature Center at McCloud Nature Park. This gallery continues to proudly be a member of The Rural Routes to Main Street Cultural Trail, a self-directed driving tour with more than 30 stops in Hendricks, Morgan and Putnam counties. Our naturalists take applications for artwork to be displayed, and each month, they choose a different artist and display their work. April&apos;s featured artist is Jackie Curts, whose outstanding photography can be seen at Jackie Curts Photography on Facebook. 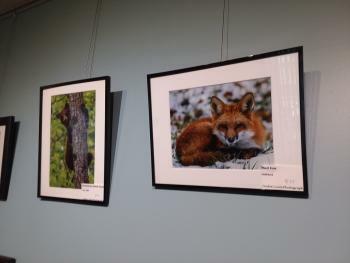 McCloud now exhibits several of her wonderful photos, so we invite everyone to come out and admire her craft. The Nature Center remains open Wednesdays through Saturdays from 10 a.m. to 4 p.m., and beginning May 1, it will also be open on Sundays from 1 to 5 p.m. Admission to the park and the Nature Center is always free. In addition to admiring Jackie&apos;s photos that hang in the Nature Center, be sure to check out our new interactive exhibit and pay special attention to the background photos. Jackie took those pictures, too! Jackie taught a nature photography course at McCloud Nature Park last fall that immediately filled to capacity, and her second scheduled course in late April is also full. We&apos;re trying to talk her into doing another program this fall, so stay tuned! May will feature a new artist, June will feature another one, and so on, giving visitors plenty of reason to come out to McCloud Nature Park again and again. Are you interested in having your own artwork considered for display at the Nature Center? Click here to learn more. Additionally, we unveiled a new program last summer called Plein Air ("open air") Painting at our parks, and it&apos;s back again this summer. Local artist Rachel Davis of The Purple Palette (pictured at the top of this post) teaches these programs at McCloud Nature Park and Sodalis Nature Park throughout the summer, and she takes care of all of the canvasses, paints, brushes and other supplies. All you have to do is register, show up and paint. Rachel picks a spot at one of our parks, and then registered participants come and paint what they see while they enjoy the great outdoors. Rachel provides step-by-step instruction, and all levels of painting experience -- including no experience at all -- are welcome. Our park naturalists are also there to give you information about the park and what you&apos;re painting. Each program costs $30 per person and lasts for about two hours. 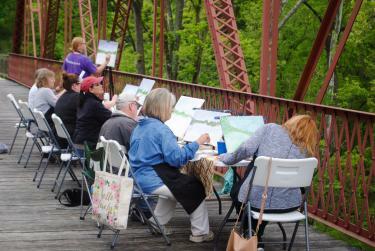 Participants take their paintings home at the end of the program. We have even more opportunities for art in the parks this summer. Create and decorate your own toad abode on May 12 at Sodalis Nature Park (click here to register). Show us your photography skills during the digital scavenger hunt and contest at our parks on June 23 (click here to learn more). Create some nail-and-string art on July 14 at McCloud Nature Park (click here to register). Make your own upcycled nature design T-shirt on Aug. 4 at McCloud Nature Park (click here to learn more). Or bring your camera, your easel, your drawing book or whatever your medium of choice is out to our parks any day from dawn to dusk, and discover how you can blend art and nature. Want to learn more about our parks? Visit our website or check us out on Facebook. We look forward to seeing you at McCloud Nature Park, Sodalis Nature Park and on the Vandalia Trail!